Since the release of Autodesk 360 Cloud-based Rendering, the demand to render RPC Content in the cloud has been constant. Initially, only the in-application RPC entourage rendered in the cloud. After much collaboration between ArchVision and Autodesk, RPC rendering support is now available for all ArchVision Dashboard RPC Content objects. Please keep in mind that this is early in the release cycle; user feedback is critical. Let us know how your experience goes! How do I enable support? To enable support for rendering RPCs in Autodesk 360 download the Autodesk Revit 2014 Update Release 2 from the Autodesk Revit Services & Support page. How do I place RPC Content into my Revit Project? To take advantage of this feature simply Drag & Drop RPC objects from ArchVision Dashboard into your Revit project and then click on Render in Cloud under View. For instructions on using RPCs in Revit, please click here. Which RPC Content is supported? Every RPC that is featured in ArchVision Dashboard will render. Custom created RPC Content support is coming soon! ArchVision Dashboard provides the platform for a series of new features, including RPC Drag & Drop into Revit and will also enable support for RPC Custom Content in the future. We are seeking beta testers now. Email us at support@archvision.com for more information. To ensure correct rendering results, please use a camera view. At present, orthographic views are presenting unpredictable results. This is a known issue and is being addressed. Some users are reporting ‘Unknown Errors’ with job submissions. This is also being investigated. If you experience other issues, please report them to Autodesk 360 and to our support@archvision.com channel. Watch for updates here at blog.archvision.com. 5 Responses to The Wait is Over! Autodesk 360 Cloud-based Rendering for RPC Content is Available. 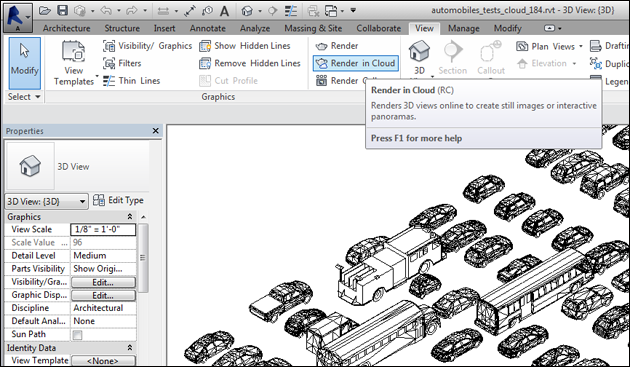 Does cloud rendering work for Revit 2013? So far when I try to render RPC Content in the cloud I only get error results. Autodesk 360 has enabled support for Revit 2014.
any news on custom RPC content? i tested but its not working on revit 2014… maybe on revit 2015?